Shown in the top photo is the sink cabinet with all drawers removed. 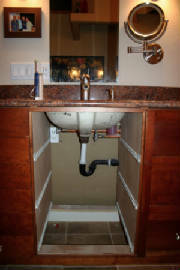 The plumbing is built into the wall space which allows for full length drawers and complete access to required fittings. 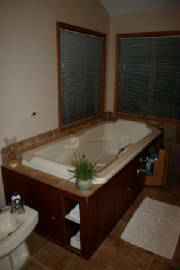 The bottom photo shows a two person tub with enclosure. One of the access doors is ajar showing a complement of shelves which fits the contour of the tub and makes complete usage of the space under the tub. Both of these custom designs demonstrate some of the creative ideas I design into your solutions.